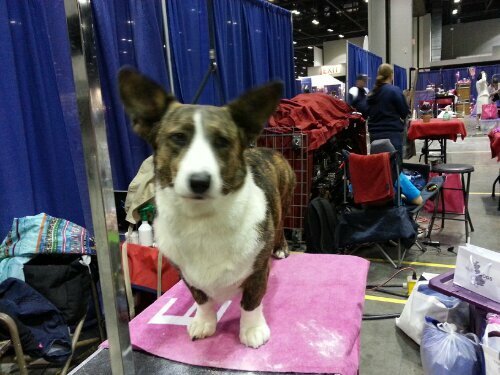 The AKC/Eukanuba National Championship is a BIG Show! 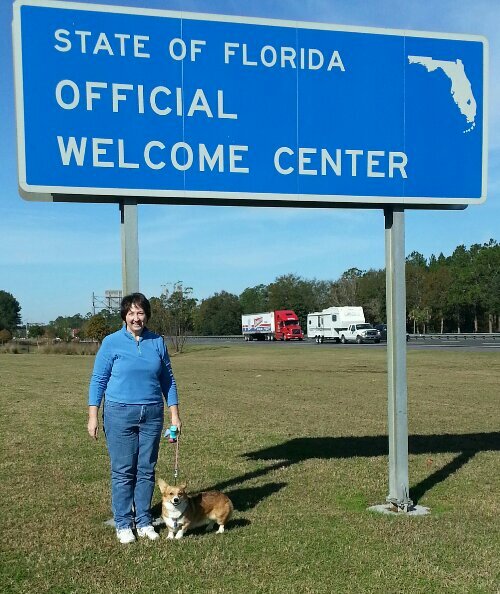 BFF Leslie and I took our BBE girls Dori and Bailey and went on an adventure to Orlando Florida. 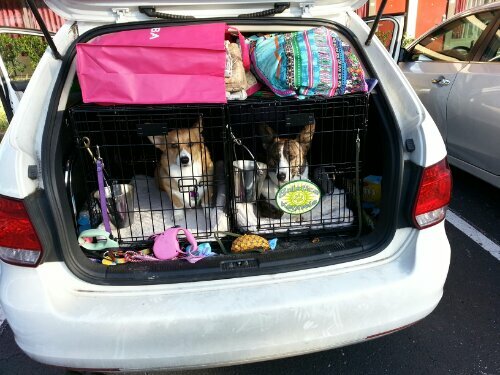 The girls all loaded up and ready for adventure! We made it! The popular state line photo op! 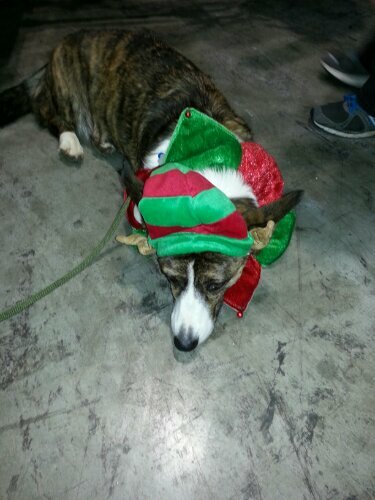 Bailey wasn’t thrilled with her “outfit” for the Meet the Breed booth. 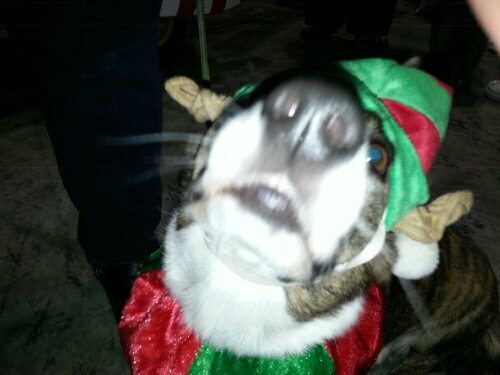 The CWCCA had a Christmas MTB booth and it was well attended and supported there always lots of Cardigans, Cardi folks and spectators learning about our wonderful breed. 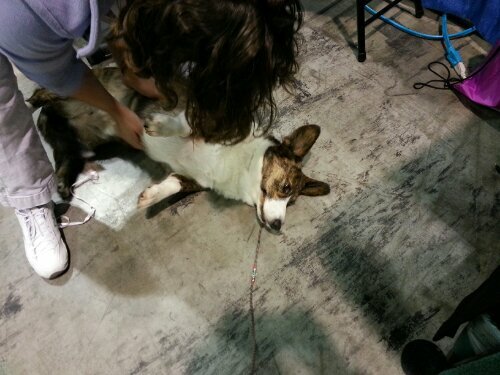 Bailey lead the rock star life the 1st day we were there, she meet her “public and fans” at the MTB booth. Went to a professional photo shoot with the AKC photographers (we are looking forward to seeing those photos) and then on to have a massage. Poor thing, such a hard life of a show dog. This was one of my favorite moments of the weekend, Dori singing the National Anthem. I know it wasn’t very patriotic of me to take a photo but I couldn’t help it or laughing either. Leslie and Dori in the big blue ring. Bailey all pretty for her trip around the big blue ring. 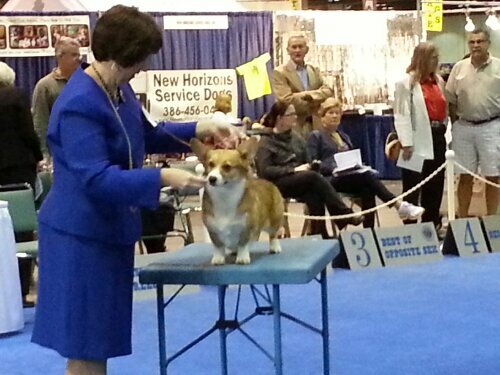 The Cardigan entry was beautiful, it was a proud moment to see what a lovely entry we presented at the AENC. 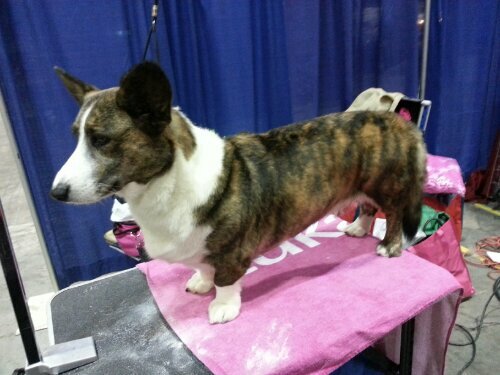 Bailey made me proud, she showed well and it was a special memory to exhibit my Bred By girl at the National Championship. We had a great time and like every weekend our beautiful show dogs, pack up and head home to go back on squirrel patrol and sofa sleeping duty. 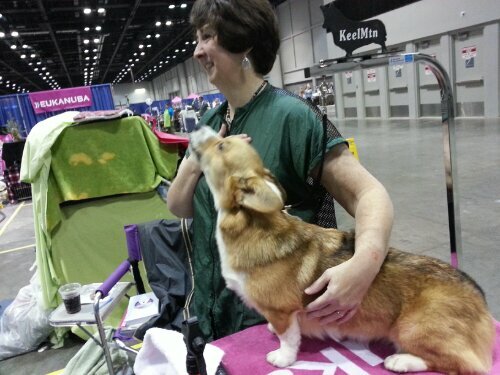 For those of us who participate in American Kennel Club events attending the AENC should be a must at some point. 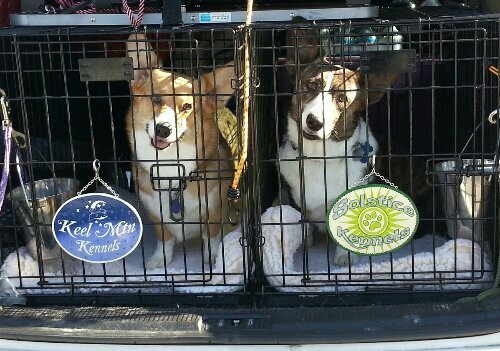 It is a great way to remember all the good the AKC does for dogs. They = We are really the more than about Champion Dogs we are the Dog Champions. Just seeing all the things like AKC Reunite, Health Foundation, the new AKC disaster relief trailers. All the fun activities that the give people a chance to build a bond with their best friends. We are proud of our purebred, purposely bred dogs but in the end we #CelebrateDogs, all dogs and the special relationships we have with our canine partners. Have you seen the commercial on TV with the tri colored Cardigan swimming? Makes me remember that Ziippy’s mom is a tri, right? The commercial is awesome! Love those little legs paddling like crazy! We love that commercial too. It looks like Zippy’s brother Charlie. Yes, Lindy is also Tri.